Abundance is and “More” is on sale! This week the kindle version of “More . . . 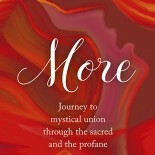 Journey to mystical union through the sacred and the profane” is on sale for $0.99! I invite you to come with me on a journey I took years ago searching for more–feeling something was lacking. The journey was both forbidding and transcendent taking me to peaks and valleys I had never considered, but ultimately making me realize it’s not about the peaks and valleys after all. It’s not about a goal at all. It is about being present to everything. Accepting everything. Relaxing. Today I look out my window and realize: Abundance is. More mystery, more connection, more intimacy, more awe is here. Right Now. Tears or not. This entry was posted on April 3, 2017 by Mariah in Uncategorized.